From September to November 2011, the Institute of Archaeology carried out the salvage archaeological investigations of the AN 5 Poljana Križevačka 2 site on the route of the A12 motorway Sv. Helena – BC Gola. A total of 29560 m2 were investigated. The Poljana Križevačka 2 site is situated several kilometres to the south of Križevci, along the western edge of the present-day settlement of Poljana Križevačka. This is a slightly raised oval elevation on the eastern bank of the Glogovnica brook, which extends into gentle hills in the east, while the Špiranečki Lug valley spreads to the west of the site. 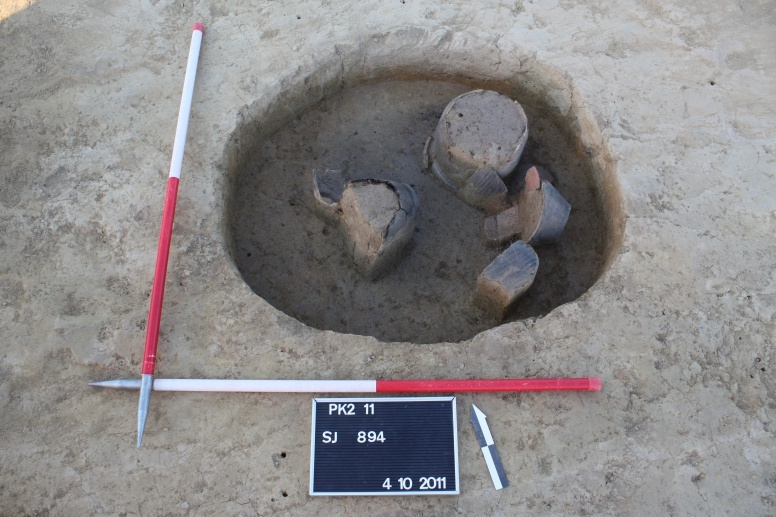 The salvage investigations at the AN 5 Poljana Križevačka 2 site yielded the remains of a prehistoric and a mediaeval settlement. The earliest traces of habitation are related to the Copper Age Lasinja culture, but the majority of the finds belong to a settlement of the Late Bronze Age Virovitica group, with the associated cemetery with cremation burials. Other discoveries include a dwelling of the Late Iron Age La Tène culture, and the remains of a late mediaeval settlement on the southern part of the site. The Lasinja culture settlement occupied the highest part of the elevation, where large oval pit-houses and smaller pits were distinguished. Taking into consideration the clustering of a number of structures in this part of the site, it can be supposed that the centre of the settlement lay closer to the Glogovnica brook. The large excavated area of the settlement reveals an interesting infrastructure, characterized by several clusters of structures, which might correspond to a family-based settlement organization. Most structures belong to the Late Bronze Age settlement, i.e. the Virovitica group of the Urnfield culture from the Br D and Ha A1 phases (13th-12th century BC). 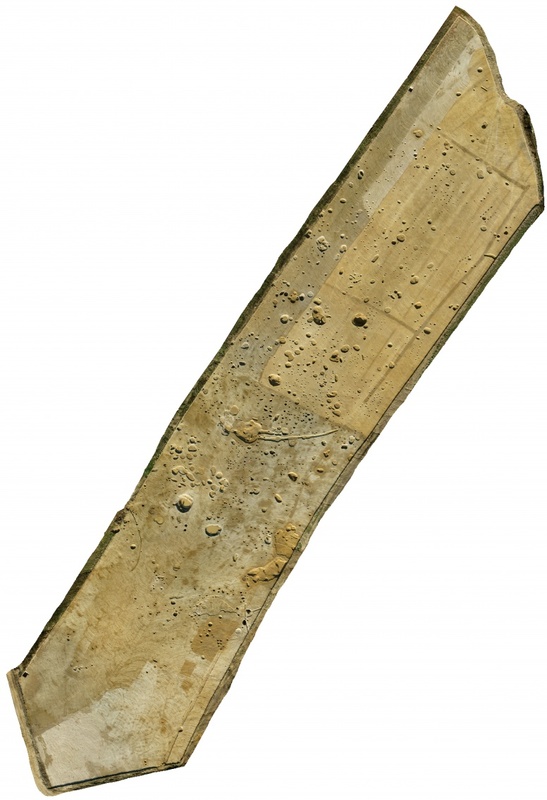 The basic residential structures were houses, whose remains consist of post-holes laid out in a rectangular pattern measuring 6 x 3 or 6 x 6 m. The same type of houses was discovered in investigations in the Prekomurje region in north-eastern Slovenia. 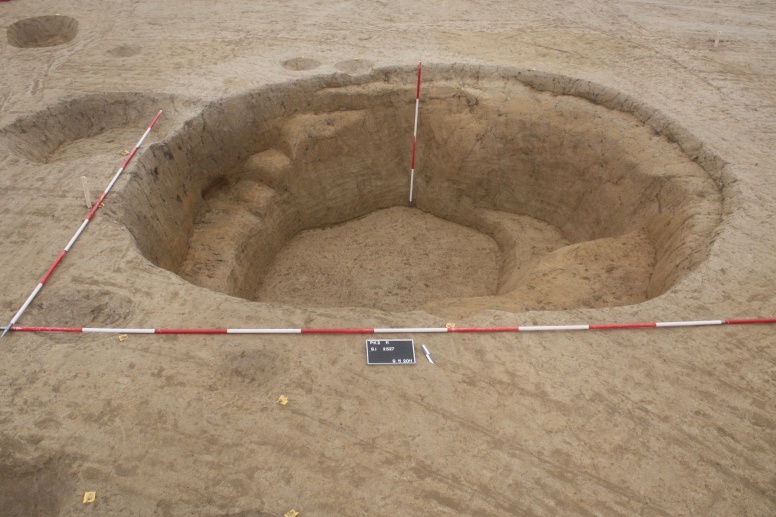 The infrastructure of the Late Bronze Age settlement includes also numerous pits, mostly of oval shape, some of which may have been used as work spaces. To the south of the settlement lay a contemporary cemetery with 50 cremation graves. The burials were urn cremations: in 47 graves the cremated remains of the deceased persons were placed in a pot, which was used as the urn, while a bowl served as the lid. Quite often fragments of broken ceramic vessels were placed in the grave. Based on the preliminary analysis of the burial rite and ceramic forms (round-bodied pots with tunnel handles and boss decoration on the point of maximum girth, S-profiled bowls with strap handles, jugs decorated with a relief stripe with fingertip impressions, cups), the graves were dated to the Br D phase, that is, to the 13th century BC. 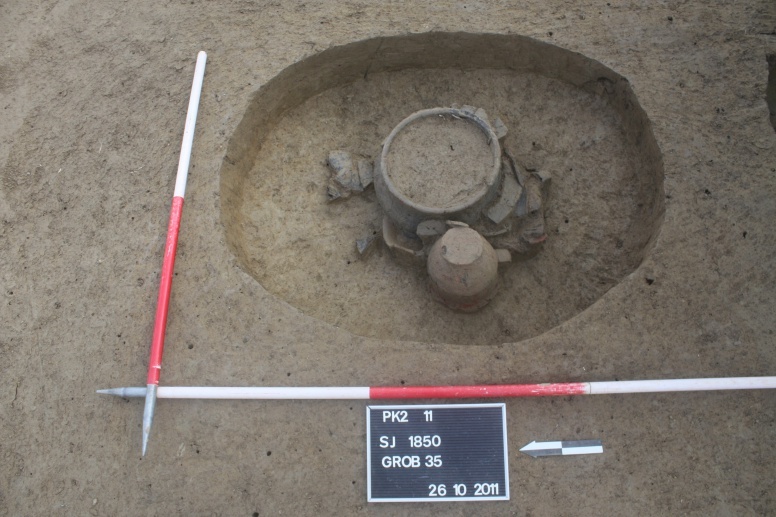 The Late Bronze Age cemetery in Poljana Križevačka 2 is the largest so far investigated cemetery of the Virovitica group in the area south of the Drava river, and the only investigated one in relation to a contemporary settlement. The remains of a house measuring 4 x 12 m discovered in the southern part of the settlement date from the La Tène culture. This was probably a farmstead belonging to a single family. Based on the potsherds found at the site, the structure can be dated to the Late La Tène period (Lt D1), that is, from the mid-2nd century BC to the first half of the 1st century BC. The remains of the settlement discovered in the south-eastern part of the site date back to the Late Middle Ages. Abundant fragments of ceramic vessels, stove tiles, heaters and fragments of iron objects can be singled out. Based on the collected finds, a preliminary dating to the mid-13th to the 15th century is possible. The position of the lowland settlement Poljana Križevačka 2, covering several chronological periods, on a natural communication following the Glogovnica brook, which connects the Podravina and Posavina regions, bears witness to the importance of that corridor for traffic over several millennia, which was one of the main reasons why the modern communication also uses the same route. Ložnjak Dizdar, D. 2012, Zaštitna istraživanja nalazišta AN 5 Poljana Križevačka 2 na trasi autoceste A12 Sv. Helena – GP Gola, Annales Instituti Archaeologici, VIII, 63 – 68.